This donut display is large enough to accommodate any of your pastries or other goods. It has 3 removable acrylic trays and two hinged back doors. You are sure to be pleased with the quality and size of this donut display. This Donut Display offers a Proven way to present your items. 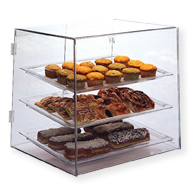 Made of clear Acrylic, this Countertop Pastry Display, Food Display is sure to impress. Buy Donut Display now - Use our convenient shopping cart or give us a call and place your order with a knowledgeable service representative today!